Bend the knees and keep the head up in a strong hockey skating position. Use this game as a warm-up or the first game in a cross ice tournament. 1. Nets across from each other in one zone. 2. Use soccer footballs or pucks. 3. Have one ball or puck for every 6 players. 4. Only one shooter at a time - no empty net goals count. 5. Use this game as a warm-up and stress good skating posture. We are in the first stages of organizing our team. I always start off with Team Play first to give a template to how we play and then we fill in the details with skill and technique drills. We did defensive zone coverage for Total Hockey - no positions once the puck drops. Everyone has a Home Position where they start on the face-off but after that it is a Read and React Game. Players home position is where they play best and most of the time they are filling that role but if a D is one of the first three players up the ice they must attack with a flat triangle and a forward must cover and know how to play as one of the last two players back and have the skill set to do it. I will try to get a video of this teaching sequence later in the season. We had a group of ten skaters at each end with different colours on. The game is played 1-2-3-4-5. Players must have the skill to count to 5 and recognize where they are on the ice in relation to teammates and the zone they are in. A. Players line up and enter the defensive zone calling out their number. - The coach places the puck in various areas. - Progress to all leaving in random order and calling out their number and going to that area. B. Offensive and defensive player skate from the blue to the red line while the coach shoots the puck in. - Players go to defensive responsibilities 1-2-3-4-5 in a combined man to man zone defense of ONE on and a BOX BEHIND. -Blue try to score and Red defend and pass to coach on turnover. - Alternate between attacking and defending. The idea of stick handling is to protect the puck from the opponent or to make him/her reach or straighten their knees and then go around them. Vladimir Jursinov is probably the most successful skills coach in the world. This Soviet and Russian Olympic coach has helped more than 65 players into the NHL from his teams. He leads a group of 15-20 years olds in a fake shot sequence. Players are in four lines and do multiple fake shots and moves, then finish with a shot.
. Practice Faking a slapshot with a hard back swing. Practice various situations. The big left handed player with the sweat suit is Dany Heatley. It is just after he won the Calder trophy. He came to say hi to the players but because we were playing transition games participated in the whole practice and then stayed and posed for pictures with each of the players. Here is a drill taken from Erkka's transition booklet which we ran at last night's half ice practice. Our team is a USA Hockey Pee Wee B level team (U12's). 1. We have our team divided, half in white jerseys and half in black. 2. We have four defensemen, who wore yellow pinnies for this drill. 3. The team is divided in half and placed on the boards at the top of the blue line. 4. The D is in the front of the line and shoot the puck behind the net. 5. Two D and three F enter zone and breakout as one team. 3. If goalie traps the puck, breakout 5v0 again. 4. If score within 60 seconds coach throws in another puck. Stress quick changes of direction while controlling the puck. 1. One player drop a tennis ball and the other is about 5m. away and sprints to get it before it hits a second time. 2. Up-around top of circle-across-around bottom and then other circle. Forward and backward 3 times in nzone and then a shot. 3. Skate to top of circle, across-up-across red line-up and back from top of circle to blue line and then shoot. This is a game from our book. I use the games all of the time but since this site is meant to update the ABC manual I haven't posted it. It is a very good way to practice specialty teams especially if you have less that 4 sets of 5. You can create any even or odd numbered situation at each end of the ice. In order to create the various situations that happen in a hockey game, play 5-on-5 and have players from one or both teams wait in the neutral zone. Extra players are on the bench. In order to create the various situations that happen in a hockey game, play 5-on-5 and have players wait in the neutral zone. - 5-4 last forward back stay in nzone. - 5-3 last two F or one F and one D stay. - 4-4 one from each team in nzone. - 4-3 one attacker and two defenders stay. - 3-3 two from each team. Practice the stretch pass and player coming out of the penalty box by passing to the player in the neutral zone. Have players change on their own or if you have at least 20 skaters use the whistle. This can be a free flow or controlled scrimmage. This is the same warm-up that the Korean teams I coached for many summers used. They brought in many Russian coaches and Kazakstan used to be part of the Soviet Union; so I am sure this routine is a standard part of Russian practices. I didn't get the entire routine on video but I know the idea is to use all of the edges, heel to heel, etc. and be in good skating posture. It is a good way to develop solid technique. Don't use the big 8 when going full speed or with huge groups that overlap. Skate forward, backward, pivot, Good to just go around when backward. Full speed 8's can be dangerous. A guy I play with collided with his best friend doing the big 8 and his friend died as a result of hitting his head on the ice. 1. Player lead or the coach call out the technique. 2. Skate forward and backward. 3. Striding, crossovers, transition forward to backward, backward to forward. 4. Side to side smooth transition. We did this one zone transition game and started with the rule that each team must have two jokers play the point. Before you could score you have to pass to the point. The jokers could check the opposition joker. We progressed to the rule that all goals had to come from point plays. This really caused the jokers to move so they could get the shot or shot pass through. Each team has one or two jokers at the point. Introduce the game allowing jokers to check jokers. This is a great game to practice getting the shot through under pressure. The jokers at the point must get open and take a shot or make a pass. The defender practices covering the point. Low players get open and defenders cover man to man. Each team has one or two jokers at the point. 1. When defenders regain puck they must pass to the point to go on offense. 2. Jokers can shoot or pass. 3. Jokers can check the opponents Joker. This is the same setup as another 2-0 shootout game. The difference is there are no whistles but instead it is a timed relay race. Count the number of goals in a certain time. Last night we counted the goals in 5 minutes. We had 3 goalies so they got a break. Two goalies it might be a 3 minute game. Also limit the passes to one or two before shooting. One is more gamelike. Work on shooting one timers and scoring on rebounds. Good habits like face the puck, give a target with the stick on the ice. Limit of 2 passes before each shot. A. 1 and 2 attack 2-0 on opposite net. B. Pass and shoot to score. C. Get a new puck from 3 or 4 after scoring. D. Score a second goal. E. After the second goal race back to the blueline and touch 3 or 4 with stick on shin pad. F. Team to score most goals in certain time wins. This is the same race but done across ice instead of the nets on the blue lines. Benefit is that the puck stays in play on wide shots. Practice skills down the lanes. Incorporate passes, shots, moves, dekes, obstacles, different pivots, jumps, multiple pucks, balls etc. This is a Howie Meeker circuit and is a great way to practice skills with large groups and use the ice efficiently. 1. Set up four lanes up and down the rink. 2. Each lane has a different task. 3. Each lane could have a shot at the end. Mission Impossible was the most popular activity I ran in schools. The pictures are from a Kindergarten to ninth grade school, 5-14 year olds. All classes did it. We set up an obstacle course with the equipment in the gym. The kid's got 8 minutes to get to the end. Any failure and they have to start again. There was complete silence because the scenario was that they are trying to escape from a prison of war camp. Half the students were guards and half prisoners. If they touched the floor anywhere but safe places, knocked anything over, made a loud noise, were touched by a snake (dangling ropes), fell off the raft and into the acid moat (off the scooter and touch the floor) etc. They had to ring the bell at the top of the rope to finish. I built in areas where cooperation was needed to pass through. At noon they all played together and there are pics with them in the regular clothes. This same idea idea can be used at hockey practice by making a progressively more difficult circuit requiring individual or partner work. This is a really good drill for pace and lines working together. It also is an opportunity to coach the offensive and defensive principles of each situation. If the F are lined on one side and the D on the other the coach can talk to them as they return to the line and not stop the drill unless it has totally gone south. Make it an ongoing contest and do it once a week or so. Forwards create 2-1 situations with close support and speed. One player always hard to the net on a middle drive on a shooting play and a wide drive if they are open. Headman the puck and move through the neutral zone quickly and make the first pass in the offensive zone early. Defenders must talk and identify coverage. Protect the middle of the ice and only play the puck carrier if he is vulnerable. Give the shot from the outside. Jam the trailer with legs in the shooting lane and stick in the passing lane. It is critical to have tight gaps and not just back in. Players are lined up along the boards in the C3 formation. Have 2 colours of jerseys and play one team vs the other if you have enough players. You can have D on one side and F on the other or they can wait on the side they will be playing. 1. Three forwards take a puck and attack 3-0. The attack is over when the puck is over the goal line. (unless the coach wants a cycle and a shot). 2. Use the same puck and go the other way attacking 3-1 vs a D from the other colour (coach puts in a new puck if there is a goal). 3. Attack 3-2 in the original direction. 4. Three F from the other coloured team attack 3-0 on the vacant end. 6. Coach count how many goals the team scores in 6 min. (or another time. 7. Keep a record of how many goals were scored. 8. F can score on rebounds above the goal line. 9. Next time if the F’s score less goals the G and D win and if they score more goals the F win. Players should do many moves down the ice and learn to shoot while skating and then follow the shot for a rebound. Work on loosening the shoulders and the ability to handle the puck with big moves all around the body. 1. Players line up in diagonal corners. 2. Leave and do various puck handling moves down the ice. 3. Next player leave about 3" later so the line up keeps moving. 4. Shoot and follow the shot. 5. Circle back and rebound for the next shooter. This is a slot drill then game we will do tonight at practice. Just thought of it and we need to control sticks in the slot and not just be there.I took a video of the second part where the defenders pass to the coach at the point who can pass or shoot while the players fight to take or protect their stick. I think the players got the idea of how to seal sticks to the outside and find and opponent in the slot on defense and get open and keep the stick free on offense. It looks chaotic but when you play in the WAR ZONE it is chaotic. Offensive players fight for offensive side and to keep their stick free and defensive players fight for defensive side and to control the attackers sticks. 1. All players are in front of the net in two colours. 2. Start with the coach calling red offense and they try to get open and the blue cover them and control their stick. 3. Progress to 2 coaches at the point. One on each team. When they pass the players change roles o to d and d to o. 4. Play a game where the defenders must pass to their coach at the point to be on offense. 5. Offensive coach can shoot or pass. 5. Everyone stays within the dots and below the top of the circles. We played this Battling Game after it is a DT4 (transition Game in one zone) game with each team having one of two jokers at the point. Jokers cover jokers and defenders must pass to the point to go onto offense. The point player then has to BATTLE to get the puck through with a pass or shot while teammates battle for position and give support. I have posted a video from the same practice to show how one technique game is reinforced by a SAG transition game. This is an example of how to use multiple nets with groups that have mixed ability levels. In this ice session we had 3 cross ice games and then moved the net for one 2/3 ice and one 1/3 ice game happening at the same time. There were 3 different modified games and each had a purpose. Game One: D2 - cross ice game with the rules there must be at least 2 passes but you have to beat a defender before passing. Game Two - cross ice game D2 - Only 1 pass Allowed Receiver must score. Game Three - D6 Variation 2 - Two Passes and All Must Score before you can score a second goal. Game one encourages passing and getting open but in order to beat a defender you must skate away from them to open ice. This is the most important habit a player can have when they get the puck. Game Two allows one pass, so a fake pass is an effective move. Theme of the practice is stickhandling and the pass receiver must make moves, dekes and protect the puck in order to score. Game Three passing rule causes passing, getting open, covering away from the puck to happen. All must score forces everyone to participate hard and get open so they can score. It also requires the players to get their head up and do things like screen away from the puck. I was taking the video so no coach was enforcing the rules in two of the games. The older players are used to modified rules and were doing them. The beginner group has more trouble because they are struggling with the basic skating and puck handling but it is good to teach them how to play at the same time. So rules must be enforced to be effective. Here is a video of the three games. I go from rink to rink to run practices, play myself and coach my hockey class and see many practices before and after mine. I also sometimes go and watch elite teams practice. The game has changed since the last NHL strike-lockout-whatever (a regular occurence now). Here are some of the main changes. - no more can opener, you have to be able to skate backward, transtion skate. - teams now back pressure the puck carrier, many all the way to the net. Creates a defensive 2-1 and now that F must be able to play the low 3-3 in the zone. - attack with 4 players - one D joins the attack and 2 F go to the net creating a low and higher triangle. This demands hard back checking and picking up the 3rd 4th and 5th attackers. - outnumbering in the corners - when the attackers back is to the play 4 defenders will be there and the weak side F having net coverage. Demands terrific puck protection skills and defensive awareness. - more teams pinch on the strong side and everyone pinches on the wide rim. A forward fills behind the D and will have to play the defensive 1-1. - hooking is now called so you have to defend from the defensive side and not reel the attacker in at the end of your stick. Given these changes I don't understand why the D would wear Black practice jerseys and take all of the defensive 1-1's and only do the passing on breakouts and not be joining in all rushes. Transition games have been around for a long time and Erkka Westerlund wrote a booklet for HC with a video but I seldom see a transition game in pracitce. Still the OLD FASHION 1 on 1 with the F's attacking and the D's defending. I watched an elite team practice yesterday in this 90's style method but I know the system they use wants the D to join the attack and they pinch on the strong side. So I am saying that the practice methods should be changing along with the way the game is changing. Hockey is going more and more to 'Total Hockey' which is based on 1-2-3-4-5 Read-Recognize-Respond. In Total Hockey all of the players have to develop ALL of the SKILLS. Everyone needs to be able to skate well both forward and backward. Everyone must be able to attack and defend in all situations from a 1-1 to a 5-5. Now being designated as a Wing, Centre, Defenseman is simply stating the 'Home Position' where you start on the faceoff. A player is designated there because most of the time he/she will need those skills but at any time in any shift the defenseman #4 may end up being attacker #2 and should recognize that and have to skills and knowledge to play that situation effectively. How should we change the way we practice. 1. Wear only two colours during practice with half the F and half the D and one goalie each colour. 2. Design the drills so that everyone attacks and defends for part of each practice. 3. Use drills to isolate technique and then turn them into transition games where after a 1-1 or 3-2 the defender must fight for rebounds and make a breakout pass. 4. 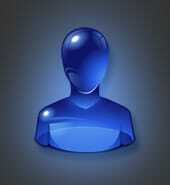 Play many games that isolate specific skills and that everyone does. A - coaches don't move pucks - players simply put the pucks where they are needed next when one activity finishes. B - only go to the board for new activities. Even many new activities can start with a simple explanation. (this whiteboard stuff started in the 80's, before that the coach simply told the players where to start, what to do and had a few of the smarter ones demonstrate) Once you have done something name it and give a 30 second reminder and get keep the practice moving - simply add tasks on the go i.e. extra passes, extra players, dump-ins. Moving 7-12 minutes per hour is just not acceptable. Practice regroups and breakout options. Jokers can pass right away or go D to D, switch, counter etc. 1. Place the nets on the opposite blue lines. 2. Play from 1-1 to 5-5. 3. Each team has 1 or 2 jokers behind their goal line. 4. Defensive team transitions to offense by passing to a joker. 5. Jokers can pass to each other, switch, drive the back of the net etc. 6. Play about 30" then switch with jokers playing, waiting players become jokers 5 and 6) and active players (1-2-3) rest. Options: After the players learn the basic game add good habits like they must move with the puck, or saucer snap passes, pivots etc. (you don’t want them standing still while passing) They could even join the rush and then return on loss of possession. I am reposting this Puck Handling drill that Vladimir Jursinov uses to teach moves and then finish with a shot. There was no video link, pdf or diagram the last time I posted it. It is a great way to teach and practice moves and warm up the goalies. I have the players stagger on the start so the goalie has a little more time to get set for the next shot. Jursi is a great guy. I was helping him with english when we coached together in Austria and last saw him in May at the IIHF coaching symposium. • From the A2 formation, players skate down the ice in 3 or 4 groups; practice big moves with the puck. One player leave and the next player go when he/she gets past the top of the circle. Finish with a shot from your lane no closer than the hash marks. • Reach forward while down on 1 knee, reach back as far as you can. • Give the puck forward and take it back with the toe of the stick. • Place hands close together and reach sideways each way as far as possible. • Practice head fakes and shoulder drops, and move the puck quickly to the other side of your body. • Do high step-overs, when you step with your right foot to the left, reach as far as possible to the right with the puck, step with the left foot to the right and reach as far as possible to the left with the puck. • Reach back as far as you can with the puck, turning the upper body so you are looking behind you as you skate in the opposite direction. Do the same the other way. • Do 3 or 4 crossovers to the left and reach as far as possible to the right with the puck, then cross over to the right and reach as far as possible to the left with the puck. Reach back as far as you can with the puck, turning the upper body so you are looking behind you as you skate in the opposite direction. • Single fake by practicing a small fake one way, then quickly pull the puck across your body to the other side. • Double fake by giving a small fake one way, then quickly pull the puck across your body to the other side. Immediately bring it back. • Put the puck behind you and pass it up into your skates from 1 side, then the other. • Have the puck in front of you and pass it back to your skates and up to your stick, then off the outside of each skate and to your stick. • Reach back on the forehand, then quickly pull the puck across your body. • Skate backwards with the puck after pivoting to the right and do the same after pivoting left. • Slide sideways, pushing about 4 or 5 times with the inside skate and gliding on the outside skate. Fake passes and shots while skating like this. • Pivot a complete circle to the left and then to the right. Any move can be practiced in this method. Maintain defensive side on the 1-1. Attack with speed on the 3-1 making the first play early while the defender delays the play from the middle. 1. Start with a forward walking out of the corner and attacking vs. one defender. 2. When 1-1 is finished two new attackers start up the ice vs. one defender. 3. The original forward join the attack and the D follow making it a 4-1. For some reason the link to video was wrong here and the title was wrong. I must have been really tired when I did it. The link is good now. This is a really high paced drill. My team went hard at it. Forwards should attack with speed and defense play a tight gap. 1. Start with a 3-0 attack from one corner. All attacks are on the same net. 2. F3 skate back and get a puck from the original end. 3. D1 leave line and defend a 1-1 vs. F3. 4. F1 and F2 come back for another puck. 5. D2 defend a 2-1 vs. F1 and F2. 6. Repeat from the other end. Defense move quickly and hinge the pass up the middle. Pass hard. Centre give the stick and skates as a flat target. Middle drive hard to the net. 1. All the players are inside the middle circle. 2. Red D1get a pass from a Red F2. 3. Red D hinge and pass D1 to D2. 4. D2 pass to F2 supporting in the middle. 5. F2 pass to F1 on the strong side. 6. F1 gain blueline and pass wide to F3. 7. F2 middle drive skating hard to the net. 8. F3 shoot and all crash the net for a rebound. 9. Blue repeat in the other direction. Pass hard in front of receiver so he doesn't have to slow up. Keep the stick blade square to the puck. Keep the stick in front when shooting in the triple threat position. 2. R2 passes back to R1 who shoots. 3. Change directions with B1 across to B2 and follow. 4. B2 skates and passes to R3 who turned at the blueline. 5. R3 shoots and B2 rebounds. 6. R5 leaves and passes to R4 and follows. 7. R4 pass to B1. 8. Continue this flow in each direction. This drill works on small parts of the big picture. Works on different passing options for a breakout. (wall, middle lane, touch backs). Stress positioning for Middle lane support. I like this position no higher than the winger on the breakout for support on a turnover. Drill starts on whistle and done on both sides . 1- Coach spots a puck in corner. 2- D 's skate backwards pivot shoulder check and pick up puck. 3- F1's take board side pass option. 4- F2's Take middle lane pass option and support . 5- F'1 and F2 skate down ice passing the puck for a shot on net. 6- Shooter holds the net front for screens , rebounds etc. Passer picks up a puck in the corner and skates high circle and cycles high with D1. 7 - D1 reads the play communicates with F for the high cycle. 8- D returns pass to F for a second shot on net. 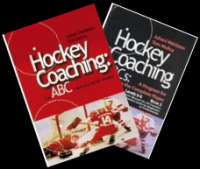 This transition game is an example of putting the drill we did for a low 2-2 http://www.hockeycoachingabcs.com/mediagallery/video.php?n=20090824224306239 into a game situation that requires the same skills but more creativity and teamwork. Jokers battle behind the net to get open and make plays. Use cut backs and protect the puck with the body. This game is a SAG below the goal line and requires good technique. 1. Each team has one or two Jokers below the goal line. 3. Play from 1-1 to 3-3 above the goal line. 4. To transition to offense you must pass to a Joker below goal line. 5. Jokers can come out as far as hash marks. A coach or player can be the Joker for the offensive team at the point. This transition game is an example of how to coach 'Total Hockey' where all the players learn to play forward and defense. Everyone gets reps attacking and defending various situations. You can only play 'Total Hockey' if you develop Total Hockey Players". If you do this then they are capable of playing any sytem and leave your team with a well rounded 'Skill Set' that will enable them to play all over the ice in all situations. If you dress your defense in a different colour and have them take all of the defensive 1-1's, 2-1's etc. they won't develop offensively like they could and the forwards will also have limited defensive skills. So all players must learn to skate forward and backward, do transition turns, know how to break out whether they are 1-2-3-4 or 5 in any zone. This is a big challenge for coaches to run practices that develop COMPLETE PLAYERS. Another challenge in developing complete players is to have playing systems (forecheck, dzone, PP) that are based on the Three R's: Read-Recognize-React. We have to develop the HARD SKILLS (what, how) of good technique in shooting, passing, puck handling, skating, pass receiving with lots of reps in practice with perfect technique. We also have to develop the SOFT SKILLS of creativity, reading the game, (where, when, why) using free flow situations such as full and small area games. BIG CHALLENGE but we wouldn't coach if it was easy. (Daniel Coyle talks about how to develop the hard and soft skills and the Three R's in his new book "The Little Book of Talent"
Supporting players follow the play and position themselves as if they were covering the point and then getting open for a breakout pass. It is important that the new defenders follow the play up the ice and close the gap in the neutral zone. 1. Players line up behind the blue lines on each side. 3. Defenders 3 and 4 follow the play into the zone and support as wingers would. 4. Offensive 1 and 2 must attack quickly. 5. After a goal, frozen puck or breakout pass 3 and 4 skate to the far blue line and turn to attack the original offensive 1 and 2. 6. Two players leave to support the defending team. After using the Tsunami there are some improvements that can be made to get the D more involved in the offense and use the forward who is covering the middle point from the top of the circles ready to go back or to be an offensive option either going for a back door back door pass or pass behind to move the puck to the other side. I also want the C to go to the strong side and usually the wing to stay on their side but if they were 3 and covering the strong side W then stay on that side as the midfielder and switch with the other wing. Attack with 4 players and create constant pressure on the puck. In the 'Tsunami' forecheck when the D pinches on the weak side they stay in and forecheck on that side and work the triangle. When the puck goes to the other side they return to the point. We want the wing to stay on their side when the puck is moved to the other side and play high slot ready to play the mid- point if they get possession or jump down back door or to the corner if the puck comes around. They are responsible for the weak side on the rush. So if the puck starts on the left side and moves to the right side then the RW and C and RD will be low. If the RW was 3 on the original attack then stay on that side and switch with the LW and play the high slot. So whichever wing was 3 become the mid-fielder. C go to the side the puck is on. The LD will have slid over to cover the point and the LW will be at the top of the circle. So it is like a high umbrella. If the puck is moved back to the left side the three forwards attack from there. The LD is back on the left point and RD on the right point. So once the original penetration is made and the puck moved to the other side it is basically man on man responsibility until the puck leaves the zone. It is like having the Pounce on both sides. The Pounce has only the RD pinching and the LW as a midfielder. The Tsunami has both D pinching when the puck is moved to the weak side and the wing on the original side becomes a midfielder ready to go back, support a weak side pass or attack back door. When it is 50-50 whether we will gain the puck or not they have to fall back and play middle D. So when we have possession there are 4 on the attack. The start of the forecheck is 1-2-3-4-5 and when the puck moves to the other side on a D to D or rim a wing stays on that side and becomes a midfielder and the C and Wing who's side it is moved to skate there and attack with 4 who has pinched wide. 1 - on puck inside to outside. 2 - cover weak side D.
3 - on D side of strong side W.
4 – mid-point weak side W responsibility. 5 - strong side point cover middle forward. On a D to D or rim to weak side. 1 - C and Wing on that side pursue. If the weak side wing was 3 on the original forecheck then they switch with the other wing and stay on the weak side when puck is moved to the other side. 3 – Mid-point pinch down on weak side wing and join the low attack. 4 - Original strong side D slide across and support new strong side point. 5 - Weak side wing read back door, low outlet or play mid D on a rush. TO SIMPLIFY THE EXPLANATION - WHEN THE RD PINCHES ON A RIM OR D TO D THE LW COVERS THE WEAK SIDE POINT. (if the puck rotates again then the 2 D are back on the points) So if the attack starts on the right side and they pass D to D or rim and the LD pinches then the RD covers the middle point. The most difficult things to coach are the Soft Skills of getting open, feeling pressure one way and quickly spinning the other way to open ice. This reading-recognizing-reacting is what determines how successful a player is during games. This feel for the game and good habits like facing the puck, giving a target, pass and immediately get open compliment the Hard Skills of passing, receiving and skating. This is a great game to practice these hard skills, soft skills and good habits. Protect the puck, use fakes and change the type of passes and the situation. This is a great game to practice puck support, getting open, passing and puck protection. 1. Active players are in the middle. 2. Jokers are lined up along the blue lines. 3. Passes to Jokers are allowed. 4. Play even situations up to 3-3. 5. Vary the situations 2-1, 3-1, 3-2. 6. On whistle leave from one end and return to the line-up at the other end. * Award one point for making 5 consecutive passes and keep score. Coaching youth hockey is very different than coaching college or in a pro organization where you usuall have at least 20 skaters. It is difficult to practice full ice team play. You scrimmage but find the players get too tired and are always changing on the go. Many youth teams only have ONE goalies or if a goalie is missing there isn't a third one to fill in. I have used this rotation line where one unit rests at the far blue after defending. Yesterday instead of waiting at the far blueline we had them wait at the far end and set up for a breakout. The defending team shoots the puck down the ice and the team that just attacked now forechecks. This adds the breakout and forecheck to the scrimmage. If the defenders gain the puck they dump it deep and skate back to touch the red line and forecheck again. If there are two goalies the passive one can set up the puck on the dump in and rotate. I will make this a regular part of our pre game practices or team play teaching practices. Nest time I will try to get a video now that the players understand the rotation. Practice team play situations with 3 groups. It is best to have one colour for each group. The next group to attack waits at the far end. Practice from 3-3 to 6-5 in a controlled scrimmage mode. Coach can give input while the players wait at the far end. 1. Red circles attack vs. Blue triangles either even or odd situation. Extra blue on the side if it is on the pk. 2. On a goal, frozen puck or turnover the blue fires it to the other end and forechecks. 3. Purple breakout and attack vs. blue and the red sets up to breakout at the far end. 4. Continue this rotation of ATTACK-DEFEND-SET UP AT FAR END. My assistant coach Sean Kibyuk in charge of the defensemen designed this small area game using two nets. The game creates lots of battles and the players must transiton from offense to defense and defense to offense. Set one net up on the goal line below the face-off dot facing up ice and the other net facing the corner just inside the circle. The game is continuous and thecoach shoot in a new puck on a goal. A. Blue 1 and 2 attack Red 1 and 2 in the corner and Blue 3 and 4 attack Red 3 and 4 from the red line. B. Coach whistles and Red 1 and 2 carry the puck out to the red line and attack the other net vs. Blue 3 and 4. C. Coach shoots in a new puck and Red 5 and 6 attack vs. Blue 1 and 2 in the corner. Red 3 and 4 return to the line. Option: Vary the number of players from 1 to 3 and switch up who starts on offense half way through the game. Good way to practice low zone coverage, D joining the play and F's coming back into the zone. A good habit is to turn up ice and find your check when you see everyone in front of you is covered. 1. Red F1-F2-F3 attack low vs. Blue D1-D2. 2. Blue F1-F2-F3 wait with a puck at the top of the circles. Extra players along the boards. 3. Red D1-D2 are ready to defend the 3-2 attack. 4. On whistle Blue F1-F2-F3 attack R D1-D2. 5. B D1-D2 join attack and R F1-F2-F3 backcheck. 6. Play 5 on 5. Alternative: Use one puck and defense pass to waiting forwards instead of 2 pucks and a whistle. All times are GMT. The time is now 04:51AM.